Intervertebral osteochondrosis (synonym: dicit, discos, hondros) is due to degenerative changes of intervertebral disk, which resulted in the depreciation of the properties of its decrease, and the elasticity and flexibility of the spine are reduced. During the process depends on a number of endogenous and exogenous factors (metabolic and hormonal disorders, micro - and macrotrauma and others). Most authors think that degenerative-dystrophic changes in the disk there are mainly under the influence of chronic overload. Intervertebral osteochondrosis begins with a change of gelatin kernel disk, turgor which decreases, and the disk is already falling as a complete shock. Under pressure of the vertebral bodies disk height is reduced, the fibrous ring protrudes beyond the intervertebral space and can exert pressure on the elements of the spinal cord. In some cases, the fibrous ring cracks through which areas dissolved gelatin kernel may fall outside the disk is formed herniated disc (so-called schmorl's hernia, cartilage hernia vertebrae). Depending on localization hernia develops a particular syndrome. Often the front disc herniation asymptomatic; rear hernia, penetrating into the spinal canal, usually accompanied by symptoms of sciatica (see). The latest in a significant number of cases are caused not by the pressure of a hernia, and inflammatory changes in the epidural tissue, nerve roots and venous stasis. Thus, the phenomenon of secondary sciatica can be caused either by the protrusion of the fibrous ring into the spinal canal in case of osteochondrosis, or a true rear disc herniation. This circumstance plays a crucial role in the choice of a technique of surgical treatment of the patient. Intervertebral osteochondrosis is most common in ninepoint Department, rarely in the cervical and even rarer in the chest. Patients (mostly men of middle and old age) usually long treated from lumbar pain", and only the depth of orthopedic and neurological examination allows to make an accurate diagnosis. The main symptom of the disease - pain of a local character in the lumbar region or irradiating to the gluteal region and in the lower limb. Sometimes they have a typical ishialgii character. During examination are marked smoothness of lumbar lordosis, sharp tension lumbar paravertebral muscles (symptom reins), sometimes develops analgetische scoliosis. Palpation of the spinous processes, related with the affected disk, noted pain. In some cases palpation disk affected by osteoarthritis through the abdominal wall, causing a sharp pain (symptom OCHA and Shkolnikova). Neurological symptoms associated with the level and pattern of damage to the intervertebral disk. For the compression of a nerve root typical complaints on pain in his area of innervation; marked paresthesia, sometimes the weakness of the limbs, the reduction or absence of the tendon reflexes. A permanent sign of defeat niinamesai roots is a symptom Lasaga. Bilateral neurological symptoms indicate a massive loss of a disk. In the diagnosis of intervertebral osteochondrosis and rear disc herniation important research cerebrospinal fluid and x-ray examination: discography (with the introduction in the center of the disk of a contrast agent), inoperative (by introducing spinous process of vertebra contrast medium) etc., cerebrospinal fluid Examination it is important for differential diagnostics of tumors and arachnoiditis. Treatment for lumbar intervertebral osteochondrosis first conservative: traction on a horizontal plane with the help of the pelvic girdle (foot end of the bed to pull on 30 - 40 cm), underwater vertical traction with cargo, massage, exercise therapy. Inegalitarian with novocaine and potassium iodide often brings relief. It is also recommended Spa treatment radon (Tskaltubo, Pyatigorsk). Wearing removable orthopedic corset shown in pain syndrome. In addition, prescribed medication pain relievers (analgin, reopirin and so on). With the failure of conservative treatment resort to neurosurgical and orthopedic operations. At the back of the herniated disc is more suitable neurosurgical path: laminectomy (see) and remove published in the spinal hernia. At osteochondrosis without a herniated disk is a generally accepted technique is anterior cervical fusion (C. D. Chaklin, 1931) - exposure of the relevant vertebral bodies and intervertebral disk vnebrachnyi access (Fig. 25). For III and IV drives an incision is performed from left to V drive on the right. If the access left after dissection of the anterior abdominal wall peritoneum push right and naked body vertebrae and disks; the aorta is shifted to the right. In right nabroshena access, I. M. Mimbrate V intervertebral disk naked below the bifurcation of the aorta in the interval between the common iliac arteries. A bit removed affected disk with thin slices of adjacent vertebral bodies. A defect in the densely introduced a bone graft taken from the iliac wing bone or tibia. 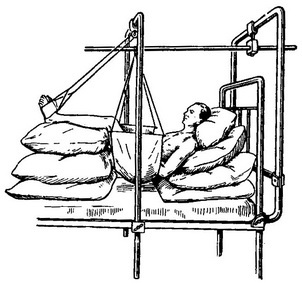 After the operation the patient give poluciaetsea position, using functional orthopedic bed or with the help of the Balkan frame and hammock (Fig. 26). In this situation the patient is 2 months; then he gradually give a horizontal reclined position, and then allowed to sit down and get up. The patient can go home in hard orthopedic corset which he bears to the full Spania of the vertebral bodies (5-6 months). Fig. 25. Anterior cervical fusion by Chaplin. Fig. 26. The position of the patient in bed after anterior spondylosyndesis.